Posted on June 9, 2011 October 15, 2012 Categories Reviewing, UncategorizedLeave a comment on Notes on a brilliant analysis of Zimbabwe by @petergodwin at LSE this eve, speaking in aid of Council for Refugee Academics. Posted on May 22, 2011 October 15, 2012 Categories Reviewing, UncategorizedLeave a comment on Very special Miro exhibition @Tate Modern at the moment. Runs until September. Posted on April 13, 2011 October 15, 2012 Categories Reviewing, UncategorizedLeave a comment on Mini-review: Agnes Obel, Bush Hall, London, 12 April 2011. Tak Agnes! 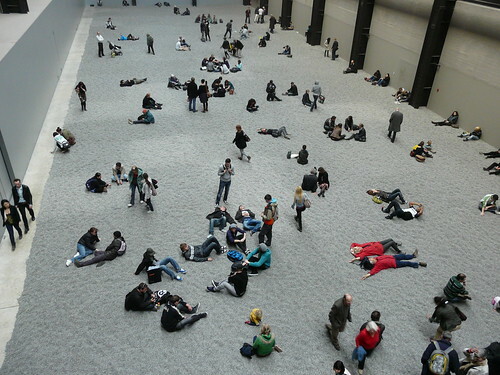 Got a Tate membership for Christmas. Want to move in permanently. Bit cold in the Turbine Hall though. However, the Turbine Hall does have this year’s Unilever exhibit in it. For 2010/2011 it’s a work by Ai Wei Wei, a Chinese artist who lived in New York for a bit, and is now based in Beijing, although he’s just had an office torn down there. Oops. It’s like a thick grey carpet on the floor of the back half of the Hall. You’d miss it but for the Tate-yellow signs and arrows. After wandering around the outside of the field of seeds, I didn’t actually believe the accompanying description. I assumed that it couldn’t actually be man-made and that it was all a bit of a joke. Even after nosing around at it for quite a while. But then Tate are showing the wonderful film below alongside the exhibit. And it turns out it’s really real, which is pleasing. 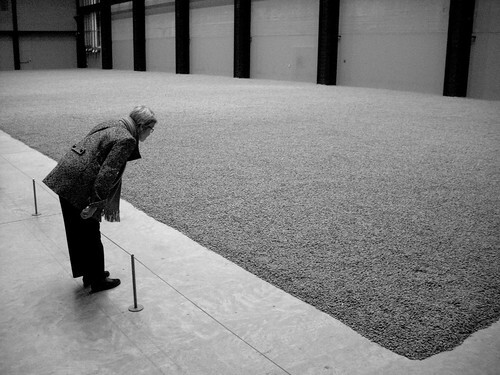 When it first opened, visitors could walk across it, or roll in it – or count the seeds. But now it’s fenced off by a miniscule little fence, so it sits, undisturbed. More like a museum exhibit. 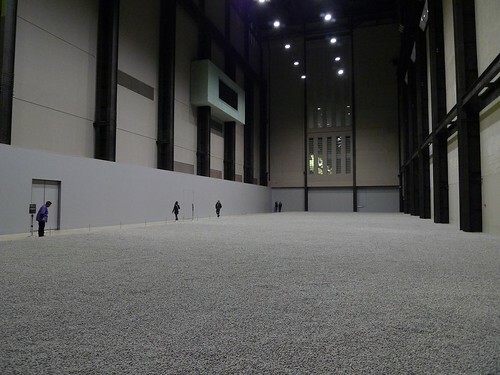 A strange forbidden sea of sunflower seeds. And it doesn’t quite work, cos they’re so small and together so huge but you can’t get in amongst them to verify anything and it’s all a bit unreal. In the film below, Ai Wei Wei talks about the project, and everything becomes clear. It comes across as a beautiful statement on globalisation – a representation of the vast quantity of trade between West and East (goods come one way, cash goes the other), and the individual stories of those involved. It reminds us of the entire process of production – and the sheer effort that went into getting one of those seeds here. And there’s 100 million of them here. Apparently. Just like all the other stuff that comes from China. He’s helped us see, imagine, consider, ponder what we get from trade. As if you could see 100 million children’s toys, mobile phones, iPads, t-shirts and whatever else that we probably import every few months. And it’s a muse on those who actually work at the mining, casting, shaping, finishing and packing that stuff. I love art that asks you to think, and this work is just beautiful. The fact that British art authorities had to stop people walking on it due to concerns over porcelain dust seems only to make the story richer. If you’re going to the exhibition (closes May 2011) then watch the film in the Hall. Otherwise, enjoy it here. Turn the sound up.